We have lived in ML from September 2004 – December 2012, working for CAMA in areas of technology support. We work closely with churches and non-profit organizations, helping them upgrade their existing systems or add new technologies to increase their productivity. In December 2012, we moved to Senegal, because of the regional role of advisers we play more and more. Anco focuses on solar energy. 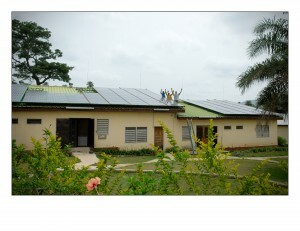 One of his priority projects was powering Bethel Bible School using only energy from the sun. Solar power systems are expensive, but once installed, they are extremely effective and efficient because the sun is always shining in Mali. Another project he is currently tackling is transforming the dry, hard school yard into a garden. This project is progressing daily. Ewien makes short (educational) videos for Maliwood Productions. She has produced several different videos, with themes including: basic hygiene, treatment of diarrhea, infant care, pregnancy, and safe food storage. She works together with Africans from beginning to end; writing the script, filming the scenes, all the way to the final production of the film. Most children in Mali (Africa) die of preventable and easily treated illnesses. This is why 1 out of 4 children is not older than 5 years of age! (Source: Unicef. nl). The videos are shown daily in the waiting rooms of a big hospital. This allows a lot of information about basic health care to be shared in a short time. Containers with useful items are frequently shipped from The Netherlands (Holland) to support all sorts of projects. Usually the items in the container are long-lasting that can help with many things. Placing solar panels on the roof of a hospital in Guinea (the only other alternative is an expensive diesel generator). Building websites, which are important, as they help people stay connected with help in and out of Africa (www.koutialahospital.org and http://fildormi.wpengine.com are examples). Technical support for existing radio stations and installation of equipment in new stations. A household that doesn’t have a radio is unthinkable in Mali. Providing energy by installing solar energy at the agricultural Christian school Beer-Sheba in Senegal: improving Agriculture. enabling the Church. transforming Communities. Mentoring and teaching young people in Senegal / Mali through technology, agriculture, and videos. Technological support in schools (adding computer lessons in the schedule). Computer projects in a jail for boys called Bolle Mineurs in Bamako, Mali. Watch some short video’s of the different types of projects. Anco has wanted to use his technology skills in places where it was needed the most ever since he was young. Before they left The Netherlands (Holland), Anco was a field supervisor at a Telecom company. Ewien was a web coordinator for the local government. Anco was raised on a farm which has enabled him to help Malian farmers gain experience and knowledge about farming and crop production. Ewien’s talent for photography helps her to achieve goals that are helpful to and benefit the African people through a means that she is passionate about!